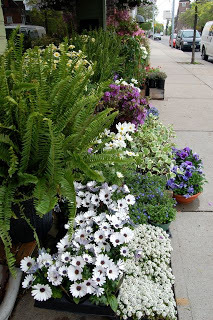 Although it’s safe to plant out many perennials as soon as the ground can we worked in spring, Victoria Day weekend is Toronto’s traditional “safe” planting day. 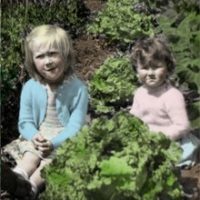 So it’s natural that today a friend asked me where I get my plants. Not that I have room for more plants, of course. I gave her four answers. One of them is here: East of Eliza on Gerrard Street East, a few doors east of Woodbine. 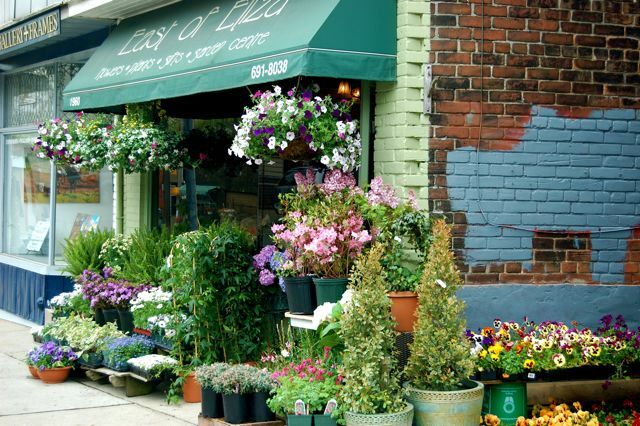 Owner Reed Russell ran Eliza Doolittle on Queen Street in the Beach for over a decade. She has been on Gerrard Street for a number of years. One thing great about East of Eliza as a plant source is that, as a floral designer, Reed has a wonderful sense of colour and form, evident in this massive changing display at her storefront. For the design-challenged, this is definitely a boon. 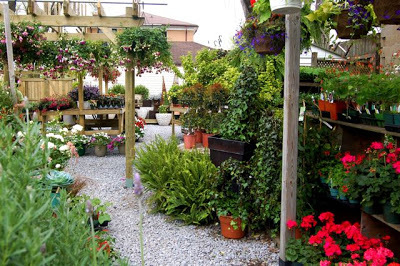 Just this year, the selection is even greater as she has enlarged her “Secret Garden” garden centre behind the store. It now seems at least twice as big, filled not only with perennials and container-ready annuals (plus ready-planted containers and hanging pots) but interesting trees and shrubs – and a good selection of pots and other accents. And here’s another thing you can count on: hard-to-find species and plant varieties such as this unusual frilly pansy seen last week. Today, for instance, Sarah and I dropped and found four wonderful lilac varieties displayed together. There was a round variety of the grand succulent, Echeveria. New introductions, such as the ‘June Fever’ Hosta. And plants such as Osteospermum in an array five or six colours and petal forms. Some of the prices, for well-grown plants mind you, are a little on the higher end of the spectrum. But Sarah purchased three very lusty-looking geraniums today that were just as large as Loblaw’s Giganticos, and $0.50 cheaper. So check it out. East of Eliza is always worth a visit.